A DD-7 double disc grinder was configured with 0.1 micron closed loop spindle slides mounted on a solid granite machine bed for stability. A bowl feeder feeds the components to a conveyor which loads and clamp on a fixture mounted on a precision slide. The part is moved between the grinding wheels to qualify the length. As the part is removed from the grinding wheel two probes measure the length of the part and compensate size as the part is ejected onto an exit conveyor. The DD-7 is one of the most compact double disc grinding machines on the market. Designed for grinding small diameter components, it accurately controls their length and perpendicularity. The machine is capable of grinding many high-performance parts for a wide range of industries from medical and aerospace to automotive. 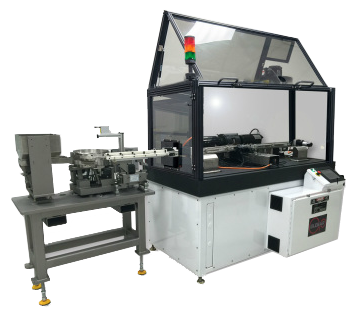 The DD-7 can be configured in three fixturing modes, depending on the application, the shape of the part, and the degree of automation required.